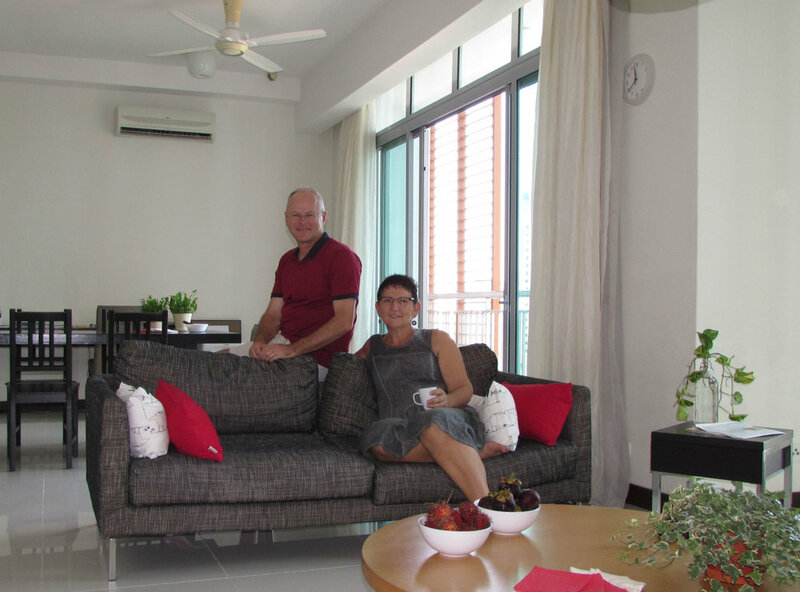 Two weeks after we arrived in Port Klang we moved into a 1450 sq. feet furnished apartment and started to make it our new home. On the 17th floor we have a commanding view in westerly direction, overlooking the old Malay district of Kampong Bharu squeezed between high-rises, highway interchanges, construction sites and on the distant horizon verdant mountains. The living room and two en suite bedrooms are modern. The washing machine and dryer are outside on a second balcony and the kitchen has a rather old fashioned gas stove, no dishwasher and minimum electrical outlets, all designed assuming a maid will do the household. Indeed we use the services of a local lady who does prepare the food for our daughter as well and therefore Francien has only cooked once a week herself. We really enjoy the delicious freshly cooked Malay curries, salads, soups and sweets. It takes some practice to keep our apartment at a comfortable temperature using the balcony sliding doors to let cool air in during the early morning hours, the ceiling fans and air-conditioning units in each room to keep the air cool and dry in the afternoon when the scorching sun burns on our windows. There is no hot water in kitchen nor bathroom, only a switch for the boiler when you want to take a hot shower. It felt good to unpack all personal belongings after living out of our suitcases for almost two months. In Cyprus we agonized over what to pack, but now we don’t miss a thing. Makes you wonder how few things you need to be happy! To familiarize ourselves with the city, Francien and I walk as much as we can bear the oppressing heat. We use the underground (LRT) and monorail to cross longer distances, taxis, visit western type of supermarkets and local street markets. Finding our way around in the city and suburbs by car using the GPS is not easy due to the spaghetti like layout of the roads, its notorious traffic jams and endless road constructions, requiring one person to drive and the other to interpret what the GPS tells us to do. We read the different English newspapers (New Straits Times, The Star, The Sun, Edge, Metro) to find out which one is most informative and listen to FM 92.90, the English speaking radio station (which much to our chagrin offers even less variety in music than the Aramco radio back in Al-Khobar). One late afternoon Francien and I strolled with a local guide through Kampong Bharu, a traditional settlement contrasting against the KLCC glittering and high-tech high-rises. It has 19th century Malay houses on stilts, gardens, streets full with hawkers, markets, stalls and family run restaurants. Cats were running on the streets. There was a stinking smell, rubbish piled up in back lanes, rats scurrying across the pavements. 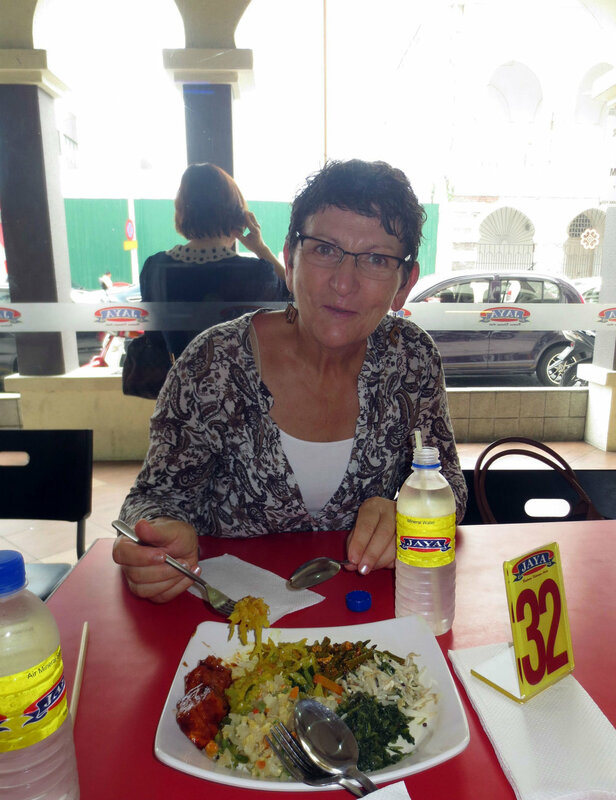 However, the food here in the eateries and in general in KL is delicious and despite the often questionable hygienic conditions on the streets, we have started to explore these. So far so good! We visited the replica of the Sultan Sulaiman Club in the centre of Kampong Bharu, the oldest social club established by the British in 1909 for the Malay elite. The British elite had their own club in the Royal Selangor Club on Merdeka square with its black and white half-timber Tudor façade and carved wooden panelling inside. Its ‘Long-Bar’ is still for men only! It reminded me of the Modderfontein club house in Johannesburg in the early 80’s and the Ahmadi golf club in Kuwait, all reminiscent of the times the Empire was still great! Never a dull moment in the city: we watched the latest Mission Impossible movie in a D-Box cinema in which the chairs are moving, perfectly synchronized with the on-screen action; we attended a TED (Technology, Entertainment, Design) conference and visited the 1909 built Masjid Jamek mosque, a Buddhist temple across the road, China Town and the heritage Central Market. Sunday at the crack of dawn our daughter Marcella, Francien and myself ran in the Taman Bukit Jalil. It is a popular recreational park in the southern suburbs of Kuala Lumpur, 20 km from the city centre on a gently sloping terrain. We were the only non-Chinese people and while running we watched elderly people practicing Tai Chi, others hitting themselves, clapping their hands, flailing their arms, rubbing against trees or walking backwards (they believe that banging ones arms and legs or rocking against a tree improves circulation and walking backwards will turn back the years!). KL is sweltering, the heat hangs over the city making running hard even at these early hours. Our bodies were completely sweaty, my cap getting soaked until it was saturated and sweat ran down his face. Thick gray clouds lingered for a long time above the city, eventually turning into downpours (which hardly bring cooler temperatures). Contrary to all the other places we have ever lived, people here never talk about the weather: guess why? Francien and I need to find new friends and build a social life in KL and therefore attended the bi-monthly InterNations expatriate get-together, the monthly Expat Mingle group and German Speaking Society meet-up. It is these organizations which help expatriates to meet each other and because we do not have any social interactions anymore via my work or our children’s schooling (as we always had the last 34 years), this is an important activity for us. We indeed met Europeans, Americans and Australians mostly on two to three year working contracts, all excited about the seemingly endless travel opportunities this location has, its excellent food and easy going lifestyle. The Eid celebrations were coming to an end. Many black abaja wearing ladies from the Middle East with their families spent Eid Holidays in the shopping malls. Francien, Marcella and myself were invited to a Hari Raya Open House, a traditional celebration after Eid whereby the local families invite family and friends into their house to enjoy a meal together. We had a BBQ, serving lamb, rendang curries, satay beef and chicken, complemented with noodles and rice. Mango juice and water was offered to drink. The people were very welcoming and friendly.